When the temperatures plunge as low as they have this week – many states are experiencing sub-zero weather conditions – it is no wonder that people are sick with colds and flu. But in reality, according to the National Institute of Allergy and Infectious Diseases (NIAID), cold weather does not actually cause colds. Most likely colds occur more frequently during cold weather because the environments within the schools inside may increase exposure to the virus that causes colds – such as the coronaviruses and the rhinoviruses, which is the one virus that causes about 35 percent of all colds. Because people are indoors more in the winter, where the air is drier, this can mean a reduction in humidity, thus contributing to dry nasal passages, making us ripe for the viruses. It actually inflames the membranes in the lining of your nose and throat. There may be more than 200 different virus strains, but out of all of the cold viruses, the rhinoviruses (nose) and the coronaviruses (eyes) cause the majority of colds. The common cold is basically just a viral and infectious disease of the upper respiratory tract affecting the nose and head. Symptoms are often miserable, including runny nose, sneezing, coughing, and a sore throat, along with joint stiffness, itchy eyes and a stuffed up head. Did you know that during a one-year period, people in the United States will most likely suffer from about a billion colds. On average adults come down with between two to four colds a year, while young kids can have up to twelve colds in a year. Research from Ohio State University tells us that colds are one of the most prevalent illnesses, leading to more doctor visits and days missed from school and work than any other sickness annually. Your overall health and resistance as well as the immune system help ward off colds, along with hand washing, avoiding touching mucous membranes such as the eyes and nose, coughing in your sleeve, hands to cover your mouth, using a tissue or handkerchief when possible or your sleeve as a last resort, and overall good hygiene. Naturalists will tell you to drink chicken soup, and that garlic, ginger or turmeric will help kill the virus germs. Get fast relief from cold and flu symptoms with Herbalix Respiratory Freedom Relief salve. symptoms of nasal and chest congestion and sinus pressure due to the common cold and flu including post nasal drip cough and even neck stiffness. Or if you are often bothered by environmental allergens like synthetic fragrances, dust and pollen, then this product can help. One of the key ingredients in the salve is Birch Essential Oil, which has the following basic properties: analgesic, antiseptic, astringent, anti-arthritic, anti-depressant detoxifying, disinfectant, anti-rheumatic, diuretic, germicide, stimulant and is even used as an insecticide. In addition to helping relieve sinus headaches discomfort or allergy pain, Respiratory Freedom™ Relief Salve offers moisturizing elements to your skin, while relieving soreness when inflamed and irritated from sniffling. The convenient packaging also makes pain relief easy. The salve is handy and never messy to carry in your purse or pocket, and great when traveling by air. The salve is all natural, as you can see from this list of pure ingredients: Rice Bran Oil, Cocoa Butter, Shea Butter Sustainable, Virgin Mango Butter, Raw Unfiltered Beeswax, Sweet Almond Oil, Jojoba Oil, Avocado Oil, First Pressed Extra Virgin Olive Oil, Chamomile, White Camphor, Lemongrass, Tea Tree Oil, Essential Oil of White Birch, Eucalyptus Essential Oil, Rosemary Essential Oil and Herbalix™ Organic Preservative. All Herbalix Salves are Acetaminophen and Gluten-free, and come in environmentally friendly packaging. You may have been hearing bad things lately about triclosan, an antifungal, antibacterial agent that is often used in consumer products such as shampoo. Triclosan, which is under FDA review, is a polychloro phenoxy phenol and has shown no real benefit to our health beyond its anti-gingivitis effect in tooth care products, and there is no known benefit for its use in hair care products. Triclosan is basically a chlorinated aromatic compound that is sold under several trade names — Amicor, BioFresh and UltraFresh. A component in many pesticides, triclosan also shows up in housing insulation, in flooring under layments (laminate and engineered wood), and carpeting used for the purpose of stopping the growth of bacteria, fungi, and mildew and in mattresses, and which has not been successfully documented or demonstrated. If you use a product containing triclosan, you could absorb a small amount through your mouth or skin. Triclosan can be bad for the immune system, according to research, and it has been proven to alter hormone regulation in animals, as well as contribute to developing antibiotic-resistant germs. In one study conducted in 2008, designed to assess exposure to triclosan in a representative sample of U.S. children and adults, researchers found triclosan in the urine of 75 percent of those tested. 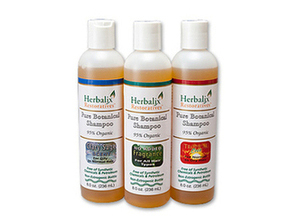 An assortment of organic shampoos include No-Fragrance. Herbalix makes an organic shampoo that is all-natural and safe, so you breathe in no chemical vapors while showering or bathing. The formula is highly concentrated, therefore the shampoo is economical because it only takes a small amount to lather up and clean your hair. This shampoo comes in 8 oz. containers — Shampoo for Normal to Oily Hair (Clary Sage), Shampoo for Normal to Dry Hair (Tropical Cove) and Balancing Shampoo for All Hair Types and (No added Fragrance). You can also try 4 oz. shampoo bars which come in Rosemary or Juniper Loves Peppermint fragrances. This convenient shampoo soap bar is great for sports and/or traveling. Take it with you whenever you need either soap or a shampoo. It is easy, convenient and fitness buffs love it because it can stay in their gym bag. Herbalix shampoos are EA-BPA and leach-free with no (EA) estrogenic activity. They are also free of phthalates and other second-hand synthetic chemicals. The company uses safe packaging, ingredient-protective, and environmentally sound. The plastic packaging used in the Herbalix Restoratives product line is identified and accepted for recycling. All of Herbalix Restoratives (http://www.herbalix.com) boxes are fully recyclable. 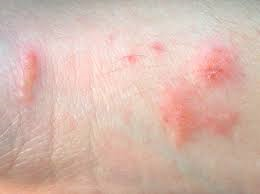 According to a study from Researcher MV Heisterberg, the most frequent cause of contact dermatitis allergy is the fragrances in deodorants, and cosmetic products are the main cause of fragrance contact allergy. This study compared deodorants and fragrance mixes, and it led Heisterberg and colleagues to determine that deodorants were the leading causes of fragrance allergy. This is especially true among men. Fragrance is not absolutely necessary to the function of a deodorant, and in fact, there are plenty of fragrance free deodorants on the market, which can help prevent contact dermatitis, asthma and allergies in general. It is also important to ask if there is a “masking agent” used to disguise the scent as these too are chemicals and do not remove the fragrance simply block the body’s ability to detect it. No Added Fragrance tells you there are no chemicals or fragrances found in the product. Contact Dermatitus of the skin. Other research has also pointed out the seriousness of aluminum in most commercial deodorants. A percentage of people who are allergic to aluminum may also experience contact dermatitis when exposed to aluminum in deodorants. Non-aluminum deodorants and antiperspirants and deodorants are safer, according to current research. It has been found that aluminum-based compounds used as active ingredients in antiperspirants form a temporary plug within the sweat duct, stopping the flow of sweat to the skin’s surface. Some research suggests that these aluminum-based compounds, typically applied frequently and also left on the skin near the breast tissue, may be absorbed by the skin and cause estrogen-like (hormonal) effects. As estrogen has the ability to promote the growth of breast cancer cells, some scientists believe that the aluminum-based compounds in antiperspirants may contribute to breast cancer. Herbalix has formulated its Nighttime Cleansing Detox Deodorant for this reason. For anyone who has been using a commercial deodorant or antiperspirant, simply check the label to see if it contains any type of aluminum, alum, petroleum or propylene glycol. These ingredients can lead to the buildup of chemicals under the arms, resulting in irritation, or worse. Antiperspirants may leave an alum salt residual in the underarm. Herbalix Nighttime Cleansing Detox Deodorant cleanses away buildup to release waste fluids, encourages healthy lymphatic flow, and absorbs all types of aluminums, encouraging a reduction in daytime odors. The New Year always prompts people to begin new regimens and promise new affirmations for better health. There are recent studies about the dangers of some of the various ingredients in our everyday personal care items and household products — causing everything from learning deficits to cancer. In fact there has been recent news about the possible link between aluminum and breast cancer. As a result non-aluminum deodorants are gaining in popularity. Stop and think it through, and it makes sense. Our underarms feature the lymph node which is in turn linked by lymphatic vessels with fluids that surrounds our cells. The lymphatic system plus the sweat glands drain waste from human tissue. This helps the body fight off infections. Some waste leaves our bodies through the sweat glands, and the liver and our kidneys. However, if our lymph glands become filled up with aluminum from the use of antiperspirants, then our bodies can’t drain the waste effectively. What really happens? Aluminum typically enters our bodies externally via pores and sweat glands, food, water, air and medications, then it collects in the tissues. Ultimately it ends up in our lymph glands. When aluminum is found in the body, it can be a contributing factor in neurological degeneration which is caused by cellular mutation. Over the last couple of years, there has been an increase in the the use of non-aluminum deodorants as people have learned more over the Internet about the potential dangers of the ingredients in traditional antiperspirant. As organic and green products become more popular, many manufacturers such as Herbalix Restoratives (http://www.herbalix.com) are eager to market their products as genuinely organic. There are a number of women, and some medical practitioners who believe that antiperspirants are linked to mammography. They often cite the hazardous health effects of radiation, and there are other studies that prove the dangers of many ingredients used in everyday beauty and personal care products including aluminum. This is why you see more and more aluminum-free deodorants on the market.